Imagine if you had to live your entire life away from other humans. Perhaps an alien race came down to Earth and abducted you and then kept you locked in a cage, so they were the only beings you ever got to know and see. You might not understand the extent of what had been stolen from you – the human connection, love, family – but you would be able to feel from deep in your core that something very important was missing from your life. That’s exactly what happened to the bear this in this story. The animal was stolen from nature at a young age and kept in isolation in a cage its entire life. The bear never came into contact with another bear or many other animals for that matter. It only knew human beings and the ones who possessed it never showed it kindness. 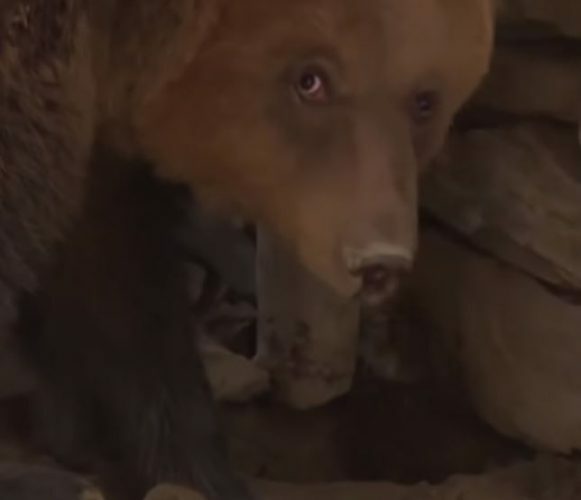 They simply wanted the bear so they could get their kicks at the animal’s expense. 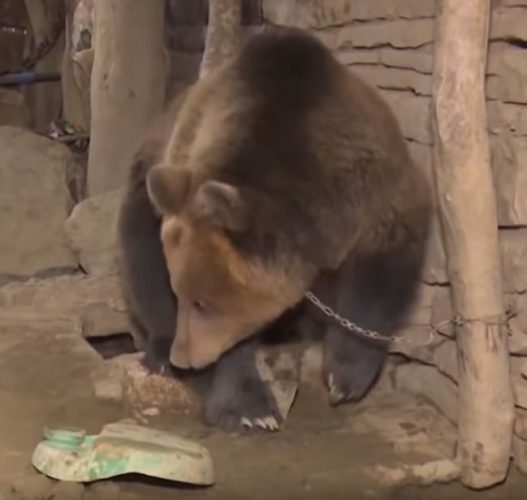 Thankfully, the good people part of an animal rescue team heard about a two-year-old bear in desperate need of rescuing. The animal was in Albania where it was kept under lock and key in a cage. Although the rescuers knew the situation was bad, when they arrived, they could never have guessed just how horrible the conditions of solitary confinement were. 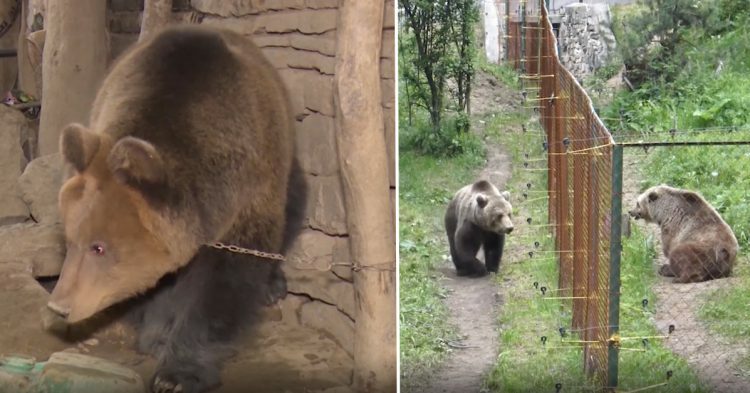 Four Paws International brought Riku to the Dancing Bears Park Belista in Bulgaria in May 2017. 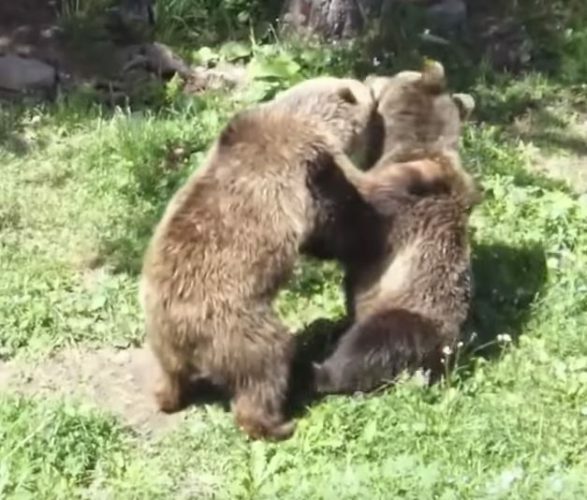 It was a monumental day for Riku because he could not only get the medical treatment he desperately needed but meet other bears who were also injured. But Riku had lived in solitary confinement for his entire life. He had never seen or been around another bear before. 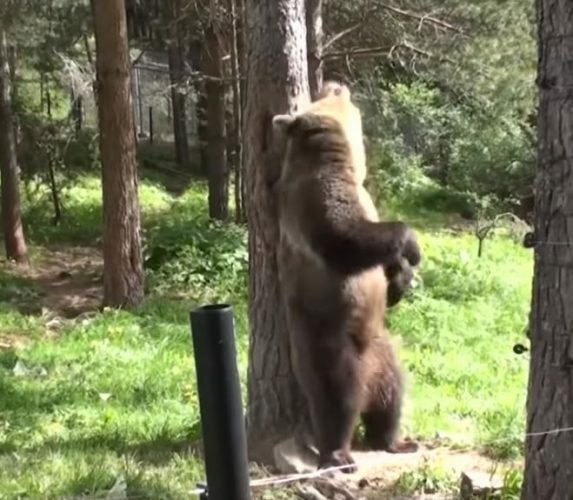 Rescue workers did not know how the bear would react when put in contact with another injured animal. But they needn’t have worried. They took the introduction slowly. But as soon as Riku was allowed, he touched noses with another rescued bear. She was 22-year-old Gabriela, who was rescued from the horrors of the Bulgarian circus. 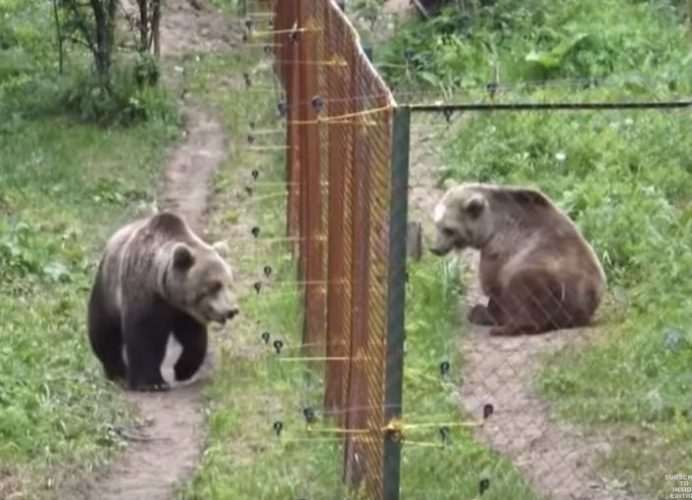 The rescuers allowed Riku and Gabriela to touch noses through the fence for many weeks. And after they felt Riku was mature enough to meet the other bear without a barrier, they decided to make that happen. Thankfully the video cameras were rolling when the animal rescuers decided to set up a meet-and-greet with Riku and Gabriela. And you can see the result in the video clip below. What do you think about Riku’s reaction to meeting another bear for the first time?